A Fertility Bracelet that is so pretty to wear, you wouldn't guess there was hidden meaning behind the stone and charm! Beautiful Tiger Eye cuff with wire-wrapped gemstone dangles and your choice of charm. The perfect gift for someone you know who has been trying, or a gift for yourself! Base of bracelet is Tiger Eye and you receive 3 gemstone dangles and a charm. Tiger Eye may eases nervous feelings and anxiety. Tiger Eye is a very powerful stone, may help to ground and bring calm and positive energy. 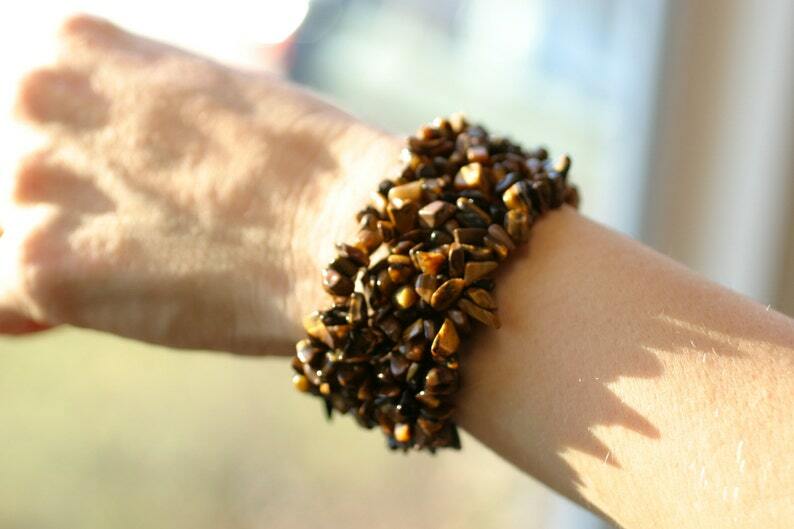 Tiger Eye may help alleviate pain, and heal ailments of the reproductive system and stomach. It may help maintain focus and aids physical vision. It may help to balance the energies of the reproductive organs. "Just some feedback I wore my braclet through my last ice cycle and I now have a daughter! My friend did the same & now has twins! We had both done many IVF cycles before this Thank you xox"
"Needless to say my friend became pregnant very soon after the gift!" "The day I ordered this I was so excited to get it so that hopefully it would help us conceive! The day I got the email it shipped I found out I was pregnant, after five years of trying it finally happened! I owe it all to the fertility garden, even though I didn't have the necklace in my possession I feel like it helped, somehow. I'm hoping this necklace helps me have a smooth pregnancy! Thank you so much fertility garden!!! "